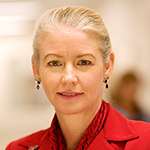 C. Noel Bairey Merz, MD, holds the Women’s Guild Endowed Chair in Women’s Health, and is Director of the Barbra Streisand Women’s Heart Center, the Linda Joy Pollin Women’s Heart Health Program, and the Preventive Cardiac Center at the Cedars-Sinai Heart Institute. She also is Professor of Medicine at Cedars-Sinai Medical Center. Dr. Bairey Merz’s research interests include women and cardiovascular disease, mental stress and heart disease, the role of exercise and stress management in reversing disease, and the role of nutrition in heart disease.